More than a dozen tech CEOs, including Apple Chief Executive Tim Cook, will meet with U.S. President Donald Trump and his staff on Monday, discussing ways that the government can trim costs and improve security with the help of American corporations. Cook will be joined by Amazon's Jeff Bezos, Microsoft's Satya Nadella, Intel's Brian Krzanich, and Google Executive Chairman Eric Schmidt. Administration officials held a conference call with press last week, in which they described an "economic opportunity" to save $1 trillion over the next decade by cutting costs and reducing Medicaid fraud, according to Reuters. CEOs from IBM, Mastercard, Qualcomm, Oracle, and Adobe are also expected to participate in the meetings. Also on the agenda for Monday is Trump's visa program, of particular interest to tech companies that hire overseas talent to help develop their products. Tech CEOs have generally had an icy response to Trump's policies, as Cook himself has publicly condemned actions such as pulling out of the Paris climate accord and seeking a travel ban that impacts Muslim-majority nations. However, technology companies also see opportunities in Trump's business-friendly administration, particularly with respect to lowering repatriation tax rates. Apple, in particular, has a massive cash hoard that swelled to $256.8 billion last quarter, with the vast majority of it held overseas. 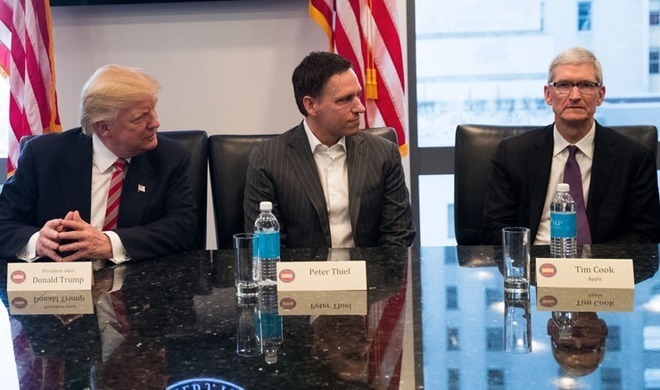 Cook was asked, along with other tech CEOs, to serve in an advisory role to the White House early on in Trump's tenure. 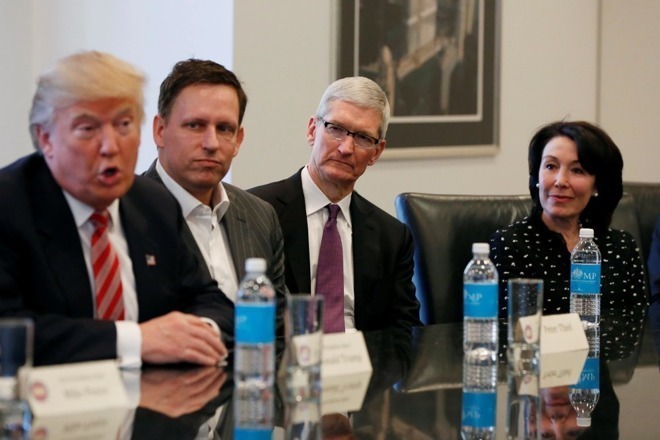 But earlier this month, Cook told an AppleInsider reader that he never accepted the position on Trump's "American Technology Council." Tesla CEO Elon Musk and Disney CEO Bob Iger publicly departed from the council after Trump withdrew from the Paris climate agreement— neither CEO is expected to take part in Monday's meeting, and administration officials reportedly said some CEOs were turned away due to lack of space. Note: Due to the political nature of this article, comments have been disabled. Appropriate discussion should be directed to our "Political Outsider" forum.